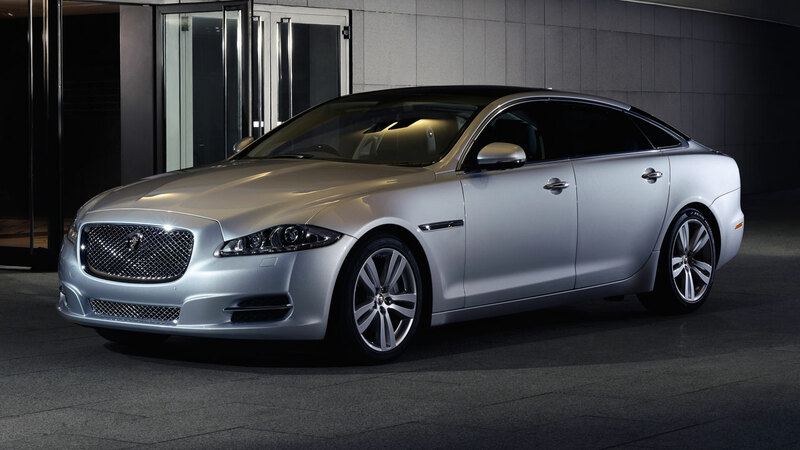 The 2014 model year Jaguar XJ is the latest in a long line of luxurious Jaguar sports saloons, incorporating enhanced rear cabin luxury features, comfort and in-car technology to create a truly elegant and contemporary luxury Jaguar. These engines are mated to Jaguar’s eight-speed automatic gearbox which offers a broad spread of ratios for a perfectly balanced combination of smooth-shifting, economy and driver control. 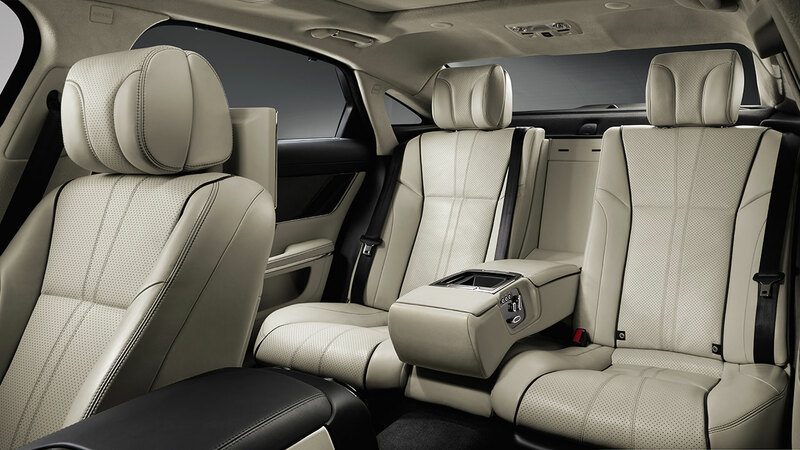 The long-wheelbase models feature enhanced rear cabin luxury options which include ‘airline’ style reclining seats with massage function, increased headroom and fold-out business tables. A specially re-tuned rear suspension set-up enhances rear seat ride comfort. 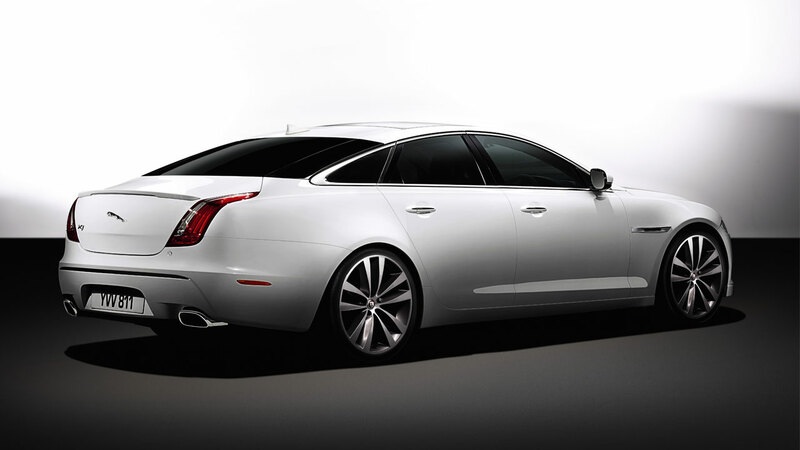 The 14MY XJ’s luxurious feel is underlined by the palette of materials used on the interior. This includes Bond grain, soft grain and semi-aniline leather, and a wide choice of veneers including Piano Black, Carbon Fibre, Gloss Burr Walnut and Satin Rosewood. The 14MY ‘R’ version of the XJ incorporates bespoke chassis and aerodynamic developments to create the most focused, agile and responsive XJR ever. Seamless performance from its 550PS/680Nm, 5.0-litre supercharged V8 engine makes the XJR capable of accelerating from zero to 60mph in 4.4 seconds (0-100km/h in 4.6 seconds) and on to an electronically limited top speed of 174mph (280km/h). 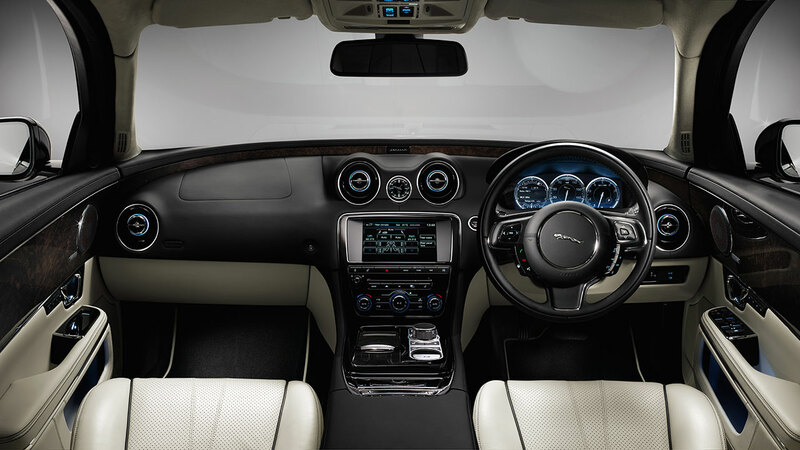 The 2014 XJ features a range of enhanced interior features focused on the rear cabin of the car, which upgrade both the luxury and functionality of the XJ’s rear environment, resulting in the most accomplished Jaguar luxury saloon. The rear passenger compartment of the 2014 LWB car is now available with two individual ‘airline style’ reclining seats which both feature cushion and squab adjustment, three massage programs – Wave/Rolling, Lumbar and Shoulder – to provide optimum levels of relaxation during long journeys, lumbar adjustment and two memory settings for each seat. The total recline adjustment of each seat is 11 degrees, with 103mm lateral cushion movement and 14 degrees of upper articulation movement. The rear seat home positioning setting returns each seat to its home position at the touch of a button on the door panel, easing entry and exit. Through the use of the front touchscreen, any one of the four electric seats can be selected and then fully controlled via the driver’s seat switches. The rear seats can be returned to their home position by the use of the touchscreen and driver’s memory buttons, and can also be programmed to return to their home position on rear door opening for ease of entry and exit. 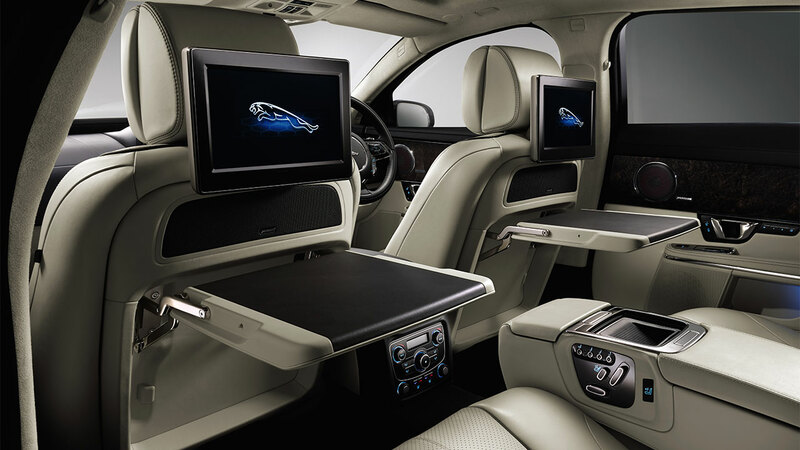 Rear-seat passengers in the LWB version of the 2014 XJ are provided with a wide range of entertainment features. The optional Rear Seat Entertainment package comprises two 10.2” high-resolution screens mounted on the back of the front seat headrests. These can display inputs from a number of sources; the DVD player, digital TV tuner or an external media player that can be synced through the Rear Media Interface, which provides USB and RCA connections. Audio can be transmitted through the wireless headphones, allowing each passenger to watch separate entertainment sources. The rear seat environment, including the entertainment, is managed by a wireless controller housed in the centre console which also allows passengers to alter their individual climate zones and seat heating and cooling functions. Maximising the benefit of the engine calibration is the eight-speed automatic transmission, which brings out the performance of the XJ while still maintaining the car’s composure in town and in low-speed driving environments. The 14MY XJ features Jaguar’s Intelligent Stop-Start system, which uses a Twin Solenoid Starter (TSS) to shut down the engine when the car comes to a halt, and restart it in less time than it takes for the driver’s foot to move from the brake to the accelerator. The system offers ‘change of mind’ functionality, enabling the engine to quickly restart even during its rundown phase to allow the driver to, for example, exploit a gap in traffic at a junction. An illuminated 'ECO' symbol appears on the instrument panel when the engine has been stopped by the system. Intelligent Stop-Start can be turned off manually, but it will automatically be turned on again for the vehicle’s next journey with every ignition cycle. The system operates in all modes apart from Reverse. The 14MY XJ has a secondary battery fitted specifically for engine re-starting, meaning that all the normal car systems – such as the entertainment system, the ventilation and lights – continue to receive power from the standard car battery and are unaffected by the re-start. In addition, a sophisticated control system ensures that the Stop/Start operation only occurs when the car does not require the engine for other functions. While this provides a truly relaxing experience for rear seat passengers, the XJ loses none of the model’s core dynamic abilities and so is as rewarding to drive as it is to be driven in. The XJ’s lightweight aluminium construction means a weight saving over its rivals of as much as 150kg, resulting in great advantages in terms of agility, acceleration, braking and driver feedback and involvement. Conversation Assist, which is only available with the Meridian™ Reference Audio System, utilises a microphone above each seating position and digital audio processing technology to reinforce the occupant’s voice via the vehicle’s audio system. This makes it much easier for occupants to be heard clearly by the other occupants in the vehicle above any cabin noise.